Life is a game of momentum… so is business. And in a world where technology and communication are linked to one another, would you want to be the business that is left behind in the MOBILE revolution? If your answer is NO, then imagine your business operating 24/7 anywhere in the world. Imagine your teams communicating clearer and faster and acting on leads almost instantly; envision a “sales-to-accounts-receivable cycle” drastically reduced putting money back in your pocket so you can reinvest and help your business grow. What’s more, imagine not only increasing revenue, but also cutting costs by maximizing financial and human capital through streamlined processes that minimizes a business’s worst enemy, wasted time. What is the result, increased profits in the palm of your hand! 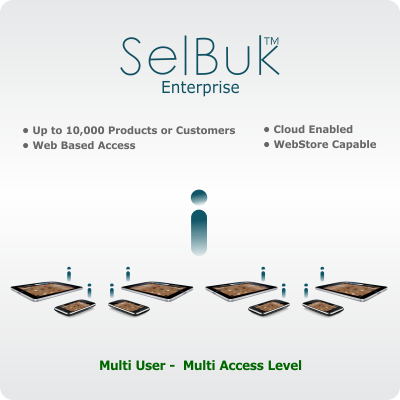 Introducing SelBuk Enterprise! A patent pending, revolutionary new mobile business management system designed by entrepreneurs for entrepreneurs and growing businesses. Best of all, you need not break the bank to become a SelBuk member. Once your company’s relevant information is uploaded into the cloud powered system, all you need is a handheld device or tablet and you are joining the few best-in-class companies globally who have gone mobile. This simple process can be done at the home or office and if help is needed, SelBuk representatives are standing by. SelBuk makes management’s job that much easier by providing a real-time holistic view of the business’ day-to-day and long term activities; allowing management to evaluate strategies and tactics on-the-go. Ability to remotely access devices to disable or lock the data to prevent access to unauthorized users. Featuring a multi-client, multi-basket function. Users have the ability to place orders, scan, email, invoice, pay and print – all in one go! Multilingual function featuring multiple dialects. As a growing business, we understand the importance of branding and how the value and meaning of your brand deliver customer loyalty. The company has the ability to “brand” it and use it as part of its many marketing efforts.